According to the National Center for Complementary and Alternative Medicine (NCCAM), a division of the National Institutes of Health, chiropractic "is a health care approach that addresses the relationship between the body's structure--mainly the spine--and its functioning." Although chiropractic largely is a safe and effective treatment, patients should understand that they might experience side effects after their treatment that include headaches, fatigue and soreness. Side effects from chiropractic care typically are mild and resolve quickly. 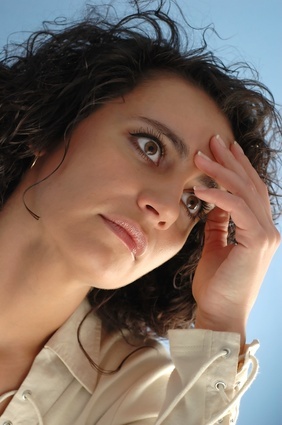 After a visit to the chiropractor, a patient may experience a mild headache that resolves within several hours. Temporary headaches are more common in chiropractic patients who have received upper cervical adjustments or trigger point work in the posterior neck muscles. According to a 2004 study by Eric L. Hurwitz and colleagues published in the Journal of Manipulative and Physiological Therapeutics, patients are more likely to experience adverse reactions to chiropractic care, including headaches, following neck manipulation than mobilization. The researchers note that chiropractors may boost patient satisfaction, and possibly clinical outcomes, by mobilizing the cervical spine instead of performing the more conventional high-velocity, low-amplitude thrust on neck pain patients. Patients who experience headaches after chiropractic care rarely report their headaches as severe, and post-treatment headaches seldom affect a person's activities of daily living. According to a 2004 study by Barbara Cagnie and colleagues published in the journal Manual Therapy, 12.1 percent of chiropractic patients reported feeling fatigued after treatment. Most of the adverse effects from chiropractic care began within four hours of treatment and typically disappeared within the following 24 hours. The researchers note that women were more likely to report side effects, including fatigue, than men. The fatigue chiropractic patients might experience after a treatment lasts for several hours, and may even be followed by a period of increased energy or alertness. Patients who get extensive bodywork or physical therapy modalities--such as hot packs--from their chiropractor may be particularly susceptible to feelings of fatigue, as tissue mobilization and moist heat may cause dehydration. To help avoid feelings of fatigue after chiropractic visits, patients should consider drinking plenty of water before their treatment. Cagnie and colleagues note that, of the 61 percent of patients who reported at least one side effect after a chiropractic session, 15 percent said they felt local discomfort or soreness. Muscle and joint stiffness and mild to moderate bruising--depending on the type of treatment provided--are common side effects after a visit to the chiropractor. First-time chiropractic patients may notice more post-treatment soreness than longtime patients. It may feel as though they have just engaged in a vigorous physical activity after an extended break. Because the chiropractor manipulates and mobilizes tissues and joints that may not have experienced much movement for months or years, it's common to feel stiff for 24 to 48 hours post-treatment. The chiropractor often recommends home care activities that you can perform when time permits or dietary suggestions to help speed your recovery and optimize your care. Is It Okay to Exercise After Seeing the Chiropractor?